An elegant 9ct white gold band set with a 15 point diamond. Seal your love forever with this elegant wedding ring, ideal for your special day and a gorgeous everyday accessory. Elegant gold jewellery for all occasions. 9ct white gold 15 point diamond wedding ring is rated 4.5 out of 5 by 19. 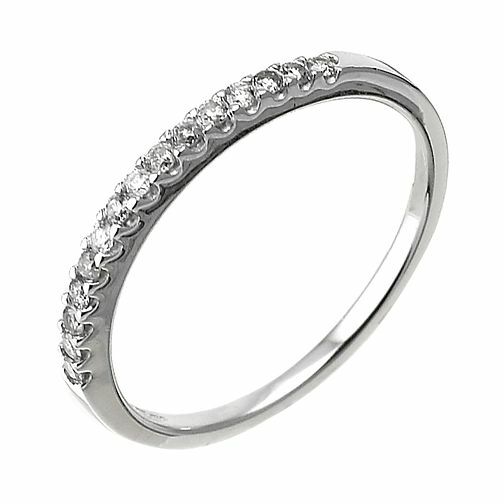 Rated 5 out of 5 by Anonymous from Very elegant My husband give me this eternity ring as a present for our Wedding anniversary,, I love the simplicity and yet elegant look of the ring. The staff at Ernest Jones in CMK are very helpful as well. Rated 4 out of 5 by Anonymous from Fine and pretty Very pretty ring that is fine and delicate and will go with any engagement ring.